Throughout Elul and into the Days of Awe (Rosh Hashanah to Yom Kippur) and Sukkot (Tabernacles), I will be posting information and inspiration for a wide audience. Because there are so many Bible readers and fans in this great big world, subjects like repentance, Rosh Hashanah, the shofar (ram’s horn), Yom Kippur, the Temple and its offerings, Sukkot in its present form and its form in the life to come, are of interest to many people Jewish and non-Jewish. Yes, fine blog readers, this article touches on the basics, which many of you already know. But there are thousands who read here and want to know more. So, forgive me if I spend a little blog real estate on new readers and internet searchers and noobs. And if you’ve been learning about and/or observing these holidays for some time, don’t be surprised if you learn something you didn’t know. As I write this, it is the 9th day of Elul, a month of the Jewish calendar which ends this year at sundown on Wednesday, September 8. Then it will be Tishri, the seventh month on the Jewish calendar. And all things seven are significant. The seventh month is the holy month. Its first day is Rosh Hashanah. Its tenth day is Yom Kippur. And days 15-22 are Sukkot. Day 23 is Shemini Atzeret. And its 24th day is Simchat Torah (when we start the Torah-reading cycle all over again — this year after sundown on September 30). Elul is important as a month of preparation. Yom Kippur in biblical times was a day of national fasting and the cleansing of all unrepented sin and unpurified defilement in the Temple. It was a judgment day of sorts. Would God bless Israel another year with a purified Temple and a good relationship? That national day of judgment has transformed from a Temple ceremony, an event in the land of Israel, into something both national and personal for every Jew. It is a day we face the Presence of God by faith and make peace for another year. You don’t enter into something like that hastily. You don’t offer God your hurried prayers of forgiveness. You meditate, examine yourself, increase devotion, and prepare for the day. So, in Elul, we blow the shofar each morning at minyan (group prayer). Its mournful sound calls us to repentance. In some circles — Christian, Hebraic roots, Messianic — the shofar is blown constantly throughout the year. It is not treated with respect. A Jewish friend recently recounted to me an experience from the 1990’s at their first service in Messianic Judaism. They were horrified that the band leading music featured a shofar and that the blower placed the instrument on the floor when he was done with it. I have seen similar misuses of the shofar. In plenty of Christian and Messianic settings, the shofar is a sort of gimmick. Several audience members bring one. Whenever the worship leader blows the shofar, these eager people pick up theirs to join in. This occurs at every meeting, especially at concerts and special events. The shofar represents something holy. It should be reserved for special times and seasons. If it is common, then it loses its sanctity. For those who use the shofar during Elul, on Rosh Hashanah, and at the end of Yom Kippur, it is holy and a sound that penetrates the soul. It should not be made common by overuse. And it certainly should be treated holy. Some people of faith regard all customs about holiness of objects as antiquated or signs of ceremonialism that is dead. This is not true. One argument against treating an object (Bible, prayerbook, shofar, Torah scroll, etc.) as holy is that God is omnipresent and thus no object is more or less holy. This completely disregards the theology of the Torah that God endues certain places and objects with more holiness and more of his Presence than others. And I would say to Christians that it is a disservice to Christian theology to consider this doctrine of holiness an obsolete custom. Yeshua (Jesus) is the ultimate expression of the Presence of God and the symbolism of holy things and places fits well with Christian theology. 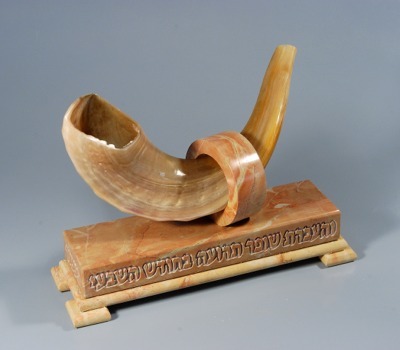 A shofar should be kept on a pedestal or table and treated with respect. Its sound brings people near to God. You can read more about the shofar and Saadiah Gaon’s ten aspects of its meaning here. I have been posting regular meditations on Psalm 27 during Elul. It is customary to recite this Psalm twice a day until Shemini Atzeret (the 8th day of Sukkot). and my salvation — at Yom Kippur. The Psalm is intensely personal, a psalm of David who wrote openly of his emotional turmoil and struggles to maintain faith in God and peace in his daily life. It’s opening declarations of faith are challenged near the end by the reality of suffering, though the psalm returns to a trusting declaration at the end. If you are accustomed to a certain level of devotion to God, it is good to increase that level in this month. If you never or rarely say morning prayers, this is a good month to add prayer a few mornings a week, if not every day. If you are not consistent in reading Torah, this is a good time to increase. We will draw near to God in Yom Kippur in a powerful way. Elul is a fitting time to begin the approach. You will be blessed if you participate. This entry was posted in Christian, Holidays, Judaism, messianic, Messianic Jewish, Messianic Judaism and tagged Elul, Psalms, Rosh HaShanah, Shemini Atzeret, shofar, Sukkot, Yom Kippur. Bookmark the permalink. I like your comments about treating certain objects as holy. Christian leaders have not taught their flocks how to respect objects that should carry a special place in our hearts. For example, I have seen bibles in bathrooms, on the floor, and even literally under people’s feet. We wouldn’t treat our food this way, nor our eating utensils. Shouldn’t God’s word be just as respected, if not more so. As always, a good post Derek. Derek, the source for the Psalm 27 thought is Vayikra Raba 21:4, “The Lord is my light- on Rosh Hashannah, and my slavation- on Yom Kippur…”.